2010 is the Year of the Tiger. Don't pretend you haven't thought it. I must have been drunk with Disney anticipation — how else to explain forgetting to share Smilin’ Jack Smollon’s “Kentuck Klassics” last week. The choices were legion. Not so with Arkansas. I believe the only time we played the Hogs during Smollon’s career as Lee County’s No. 1 radio pep-poet was in the ’84 Liberty Bowl. If he produced a tune for that game, I can’t find it. But I don’t want to go without smilin’ for two weeks in a row. And so the third installment (you can find the first here, the second here, the third here) of Rah-rahs Per Minute, TWER’s series focusing on the vinyl (and otherwise-formatted) sounds of Auburn Spirit too long relegated to the rotting Shasta box bulk-bins of our thrift stores and garage sales,﻿ is, like several previous installments, are two of… oh… 100 or so little ditties — two of the catchiest, I might add — salvaged from the dumpster behind the old WJHO offices (now WANI) in Opelika… Smilin’ Jack Smollon’s “Year of the Tiger” (1979 – Year of the Jer) and “This is the Year” (1977). This is the year, the time is here, the Year of the Tiger is here. Shed not a tear, there is no fear… this is Auburn’s year… sing it, Jack. … need more pep? Don’t forget the 1962 Beat Clemson pep-rally. 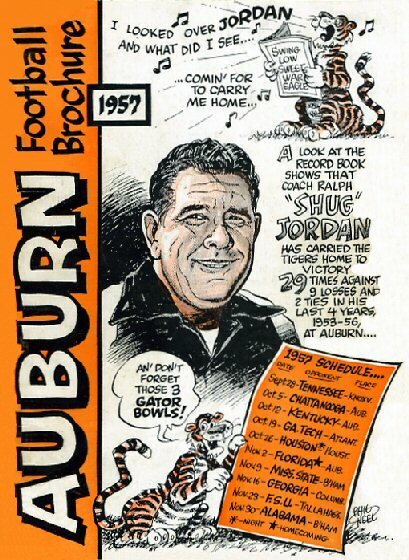 * 1957 media guide cover via WeaglWeagl.